This is a quick and easy fresh strawberry pie recipe that tastes like summer itself. Strawberry pie, made out of fresh, especially local, strawberries is such a wonderful treat. Mash enough berries to measure 1 cup. (Keep the nicest berries whole to use as the pie filling). Stir together sugar and cornstarch. Stir in water and crushed berries gradually. Cook all over medium heat, stirring constantly, until mixture thickens and boils. Boil and stir 1 minute longer. Stir in a few drops of red food coloring if desired. Let cool. Beat cream cheese until smooth. Spread it on the bottom of a cooled baked pie shell. Fill the shell with the whole strawberries. Pour cooled cooked berry mixture over the top. Chill for at least 3 hours to set. One pie is about 6 servings. 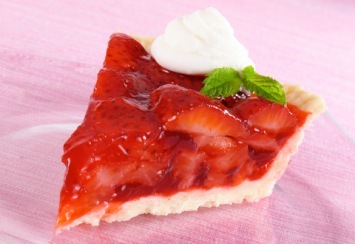 For strawberry tarts, just replace the pie pastry with individual tart shells. Follow the same instructions as the pie. To change this strawberry pie recipe into one of the nicest fresh raspberry desserts, substitute 6 cups of fresh raspberries for the strawberries. An easy raspberry pie recipe. Replace the strawberries with about 7 cups of sliced fresh peaches (about 7 medium peaches) for an easy peach pie recipe. To prevent the peaches from browning dip them in a mixture of ascorbic acid and water or lemon juice and water. Drain well before adding to the pie. You will see in the “Variations” section above that this same recipe can be easily converted into a fresh raspberry or peach pie recipe, or into individual strawberry tarts. Whatever way you make it, you just have to give this recipe a try. Strawberries are not only delicious. They are super healthy for us. Eating them for dessert is not just a treat – it’s good for us. I have noted this as a Diabetic recipe because you can pretty much eliminate the sugar content if you want to. You can replace all or at least half of the sugar with a substitute like Stevia or coconut sugar. That would lower the carb count by an amazing amount and make this a healthy diabetic dessert. We all need a bit of sweet in our lives at some point! After trying this strawberry pie recipe, you will want to try more delicious strawberry, raspberry and blueberry recipes. Find them here.